Why is Snoopy Always Joyful? 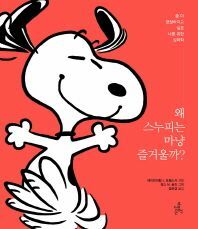 Home > Books in Korean > Fiction > Foreign Fictional Works (Translated into Korean) > Titles Starting With U ~ Z > Why is Snoopy Always Joyful? Title: Why is Snoopy Always Joyful? Original Title: That's Not a Fault...It's a Character Trait Author: Twerski, Abraham J.
Snoopy, Charlie Brown, Peppermint Patty, Linus, and all their friends, have distinct personalities we've all come to know. Sometimes we just smile at the antics of the Peanuts gang, but at other times, something in the characters' lives resonates with us. Many of their foibles or quirks represent many of our own personality traits. In That's Not a Fault, It's a Character Trait, author Abraham Twerski uses the Peanuts gang to illustrate what some of these more troublesome traits are so that we may be able to begin our own psychological assessment and healing. By using a mix of humor, insight, and a solid understanding of the human psychological condition, Twerski helps us understand the inner workings of character and provides the motivation and tools to improve.